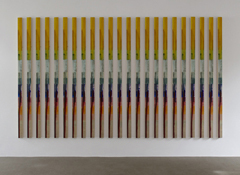 From September 22, 2012, to January 5, 2013, Galerie m Bochum will present the exhibition “Play it again, Sam.” Featured are some twenty works in the genres of painting, photography, object art and video art that deal in different ways with the theme of repetition. Repetition is a very open-ended concept and can mean either a copy of, or reference to, a prior model or also a non-hierarchical lining up of like things. Both strategies can be found paradigmatically in the prints by Bruce Nauman that are on view in the show. 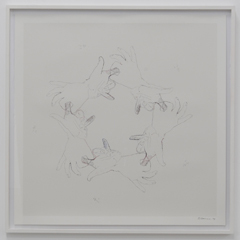 The artist repeats the motif of interlocking hands that is etched onto the printing plate to form a circle. This playful arrangement in an infinite cycle represents the iteration of equal elements with no apparent beginning or end. The repetition of identical units is more of a human ideal than a natural phenomenon. Mass production aims at just this, and the media of photography and film fascinate us with their ability to reproduce images using technical means. Humans have always taken pleasure in identical elements conjoined in a temporal or spatial sequence to form a rhythm – whether the orders of classical columns or ornaments in architecture, the recurring chorus in music, or the anaphora in poetry. In most cases, however, one encounters varying repetitions within a defined framework that, while allowing for some leeway, makes it amply clear that the elements belong together. This is the form of repetition on which the natural principle of evolution is based. Repetition is omnipresent in nature, evident in the seasons, life cycles, genera and species. And repetition is also essential to the way we perceive things, and an inescapable part of our everyday lives. The title of the exhibition, one of the most famous false quotes in cinematic history, from the film "Casablanca", reveals the power of repetition to take on a life of its own remote from actual reality. Similarly, Peter Wegner’s Buildings Made of Sky enduringly sensitize us to an image of reality formerly hidden from our cursory gaze. Artists have diverse ways of dealing with our experience of repetition and the possibilities it offers. Repetition as aesthetic principle is basically distinguished by the tension whipped up between repetition and variation. The interesting question is just how this tension-charged contrast is realized in each case. The series has played a role in artistic repetition ever since the advent of Modernism. Artists such as Claude Monet and Paul Cézanne were aware of the impossibility of capturing natural variety and mutability in a single work, and thus tried to at least adumbrate these qualities in entire complexes of works on the same motif. Still today, artists often take recourse to the series in order to convey their observations of natural phenomena, as demonstrated for example by Caroline von Grone and Lucinda Devlin. 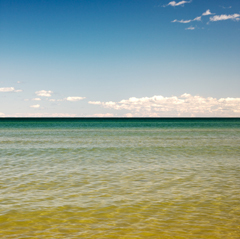 In Devlin’s Lake Pictures, views of Lake Huron unfold picture by picture in all their inexhaustible variety. 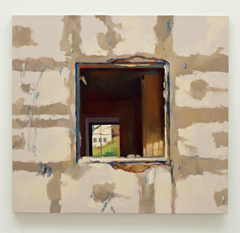 In painting, repetition as a fundamental design principle can sometimes lead to a variety of pictorial solutions. This is the case with Kuno Gonschior’s works. Depending on their color, his paintings either exhort us to scrutinize them carefully or they overwhelm the eye so much that the individual dots start to vibrate. François Perrodin varies the size, color and arrangement of rectangles to create a light-hearted, dancing rhythm. Painted images must each be individually crafted, even when they show the same motif or follow the same design principle. Series production for the purpose of making identical copies is thus in principle anathema to painting. Alfredo Álvarez Plágaro turns this aspect into a conundrum with his Identical Paintings; although they may look identical at first glance, each painting in fact exhibits widely divergent details. The development of all the individual elements simultaneously leads to a non-hierarchical juxtaposition. Lee Ufan’s works on paper for their part display the continuous repetition of simple characters. The focus here is on individual execution of gestures that are reduced to a minimum. With the invention of the negative-positive process in the 1830s, William Henry Fox Talbot created the prerequisite for the production of identical prints in any number. The technical process alone is already based on repetition. But beyond this, photographers have always worked in series. The character of a series develops in each case from constant and variable features of the individual images. 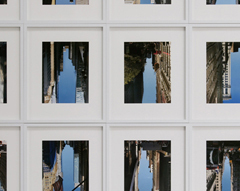 Thomas Florschuetz, for example, varies the angle from which a particular building is seen and thus emphasizes genuine architectural aspects: the different perspectives show vistas and spaces as monumental fragments of the building that open or close as the viewer moves past them. Beyond the media-driven aspects of the series, artists show us in terms of content as well how many different repetitive phenomena can be found in nature and in human life. Simone Nieweg’s photographs of the cultural landscape explore the rhythm of the seasons; the diversity, individuality and taxonomy of plants; and the constant renewal of things that nonetheless always stay the same. Likewise revealed here is how the marks left by human civilization on nature – planted fields, vegetable gardens and forests – also resonate with visual aspects of repetition. Our everyday lives are shaped in astounding ways by repetition, because the human brain has a penchant for fixed habits. This is the only way we can manage to devote our attention to what matters most at any particular moment, while other actions are carried out automatically. In this respect, habits have an almost meditative character. Evelina Cajacob’s video installation HandArbeit makes this quality tangible, and Melanie Manchot’s Bowls likewise exude in their aesthetic of asceticism an atmosphere of calm concentration. The human need for repetition is reflected as well in the form of memorial days, rituals and customs. Texts, images and rites with centuries of tradition shape our consciousness as collective cultural memories and leave their mark on our view of the world over generations. Accordingly, in the Christian religion the Church has the central task of bearing witness over and over again, under the changing conditions of the times, to the death and resurrection of Christ. Arnulf Rainer finds his own way of grappling with Christian tradition and symbolism in his artistic ritual of painting over the cross. In "Casablanca“, Ilsa asks to Sam play the song “As Time Goes By” as she indulges in nostalgic memories of her love affair with Rick. Her words, “Play it, Sam,” might serve as an amusing caption for Evelyn Hofer’s photograph series Just Married. In the serial presentation of the couples fresh from their nuptials, the ritual of the wedding as celebrated across generations takes on a peculiar ambivalence, caught up between the unvarying repetition of the social custom and the absolute uniqueness of each personal life story.